Romantic scarf felted of purple merino wool and equipped with a flower brooch. 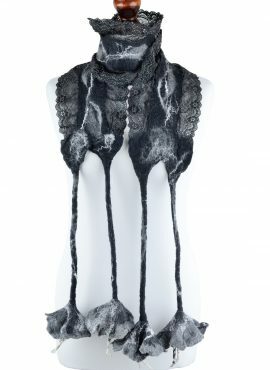 This piece of fiber art will make your look stylish and mysterious. This black lace scarf is really chic and stylish. Thanks to natural merino wool, shiny lace and felted fringe it is just perfect for elegant women. 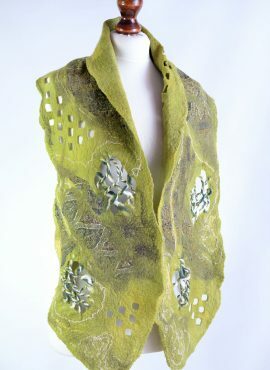 Green felt shawl with numerous square holes made of olive and pistachio wool and patterned silk fabric. Completly different from the other shawls. 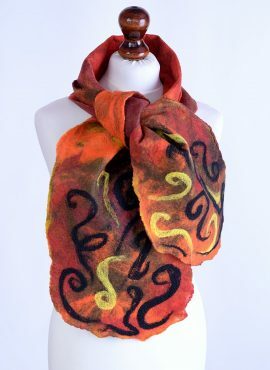 This boho felt scarf is between hippie and bohemian fashion. If you like to stand out, it can be your best way to show, what you have got inside. Blue scarf handmade of merino wool and silk. It will warm your neck in cold days and make you feel comfortable and beautiful wherever you go.